It began with a phone call from Jetstar at around 4;45pm the day before we were due to fly out. “Jetstar apologises for the inconvenience but your flight has been cancelled”. Great. So we were re-scheduled from a direct flight from Melbourne to Singapore at 11am, to domestic a flight through Sydney at 6am, then onto Singapore. And we live about 1.5 hours from the airport, resulting in stupefying 3:30am start. Almost wasn’t worth going to bed really. But a few dreamless hours is better than none I guess. Small mercies; at least our bags were checked all the way through, and the flights were with Qantas, so that meant awesome airline food and the endless entertainment choices. I managed to catch up on a couple of movies I’d missed in the cinemas (“Amore” – sublime film for those into art house that was brilliant, and “The loneliest planet” for those who like to waste two hours wondering what on earth the movie was about). And our meals were pretty Ok for airlines. With the change of flights, I didn’t have a chance to request a vegetarian meal, but the friendly airline crew rustled up a gourmet broccoli and blue cheese soup with croutons and pesto which was delicious but super rich. 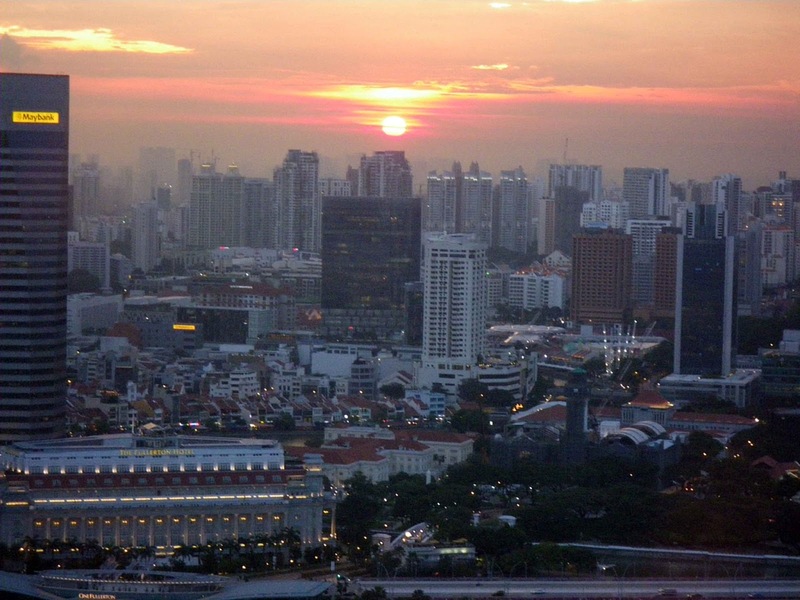 Arrival into Singapore was smooth and efficient. Go Singapore! Everything just works. I love the sense of order and plan in everything throughout the city. Even the taxi stand, where we joined a queue of maybe 100 other passengers wishing to travel into town. 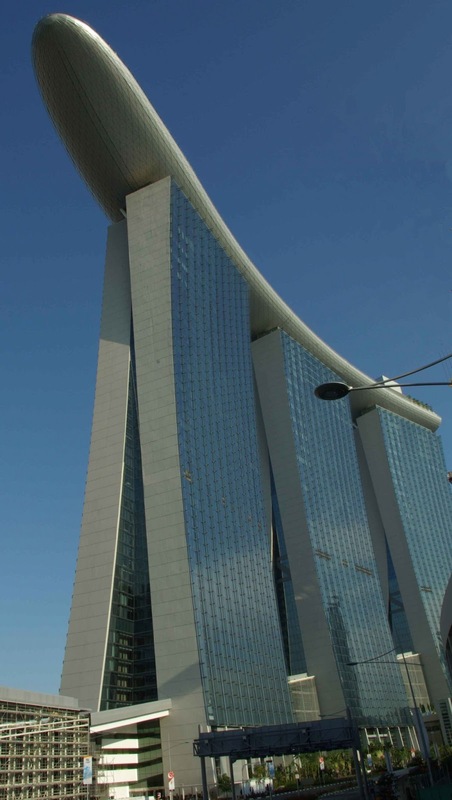 An attendant kept everyone moving along promptly and had us in a clean, air-conditioned car in a few minutes, despite the long queue, and we were at our hotel, the magnificent Marina Bay Sands, a short (and very speedy) while later. So, the excuse for the extravagance in choosing the Marina Bay was Mr J’s birthday only two days after we arrive. 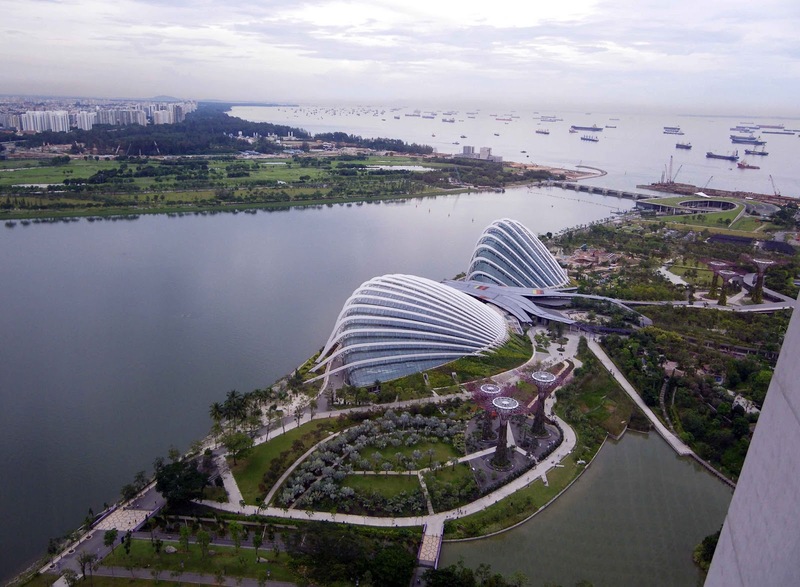 After our first visit to the towering feat of engineering precision a few years ago, we always promised to stay there if ever we stayed in Singapore again. And I managed to find discounted online room rates (of only about $350 per night for the cheapest room). 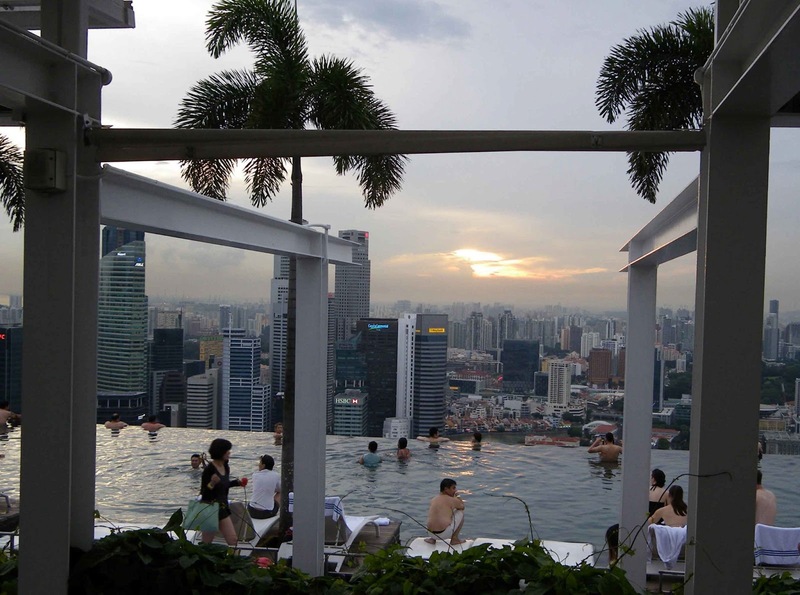 However, the allure of that spectacular infinity swimming pool, 57 stories up on the roof was worth every penny. Upon check in, the lovely Erin made some small talk as we handed over the accommodation vouchers and passports. She enquired whether we’d been to Singapore before and we told her about our vow to return and stay at that hotel. Then, ever efficient and helpful, she wished Mr J an early happy birthday, and topped it off by upgrading us to a suite. Next on the agenda was that revered roof-top pool. As we stepped out of the lift, and collected our hotel guest wrist band that permitted us entry to the poolside area, we again had to laugh at our good fortune. You couldn’t take the smile off our faces as we walked along the pool deck as couples splashed around and families played. But most bathers were perched at the pool edge, arms folded over the top of the pool wall, gazing at the view. Girls in short tennis-like skirts and mustard coloured shirts delivered drinks and snacks from the bar to the relaxing patrons on deck lounges. It was the epitome of a high-end resort. Truly extravagant, down to the towel concierge, waterfall massage jets, and semi-submerged water lounges. Pity there were so many people everywhere, making it far from relaxing. Even with hundreds of lounges lined up along the entire length of the 100 metre pool, not one was spare. Guests talked and laughed, enjoying the lively atmosphere. The sun was setting and it was clearly time for a beer. After checking out the few options, we headed to the pool bar area which had a few tables that overlooked the harbour on one side, and the pool on the other. Deciding we were also hungry (but not up to a large sit down meal after being suitably fed on the plane), we ordered fries and spring rolls along with a couple of Tiger drafts. That first beer in a foreign county always tastes so good. And with evening descending, and the balmy night air, I relaxed once again marvelling in the view. A short swim and another drink later, I was unconscious in the super-comfortable king-sized bed. Once again, good night Sing..